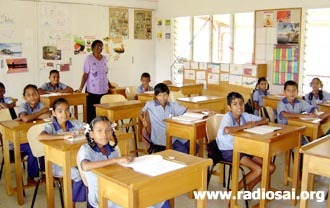 “Do you believe in a Fiji where there is no violence, hatred, ethnic division and crime? Or have you lost that hope already - a hope of living in our country like we used to be in the early seventies and eighties? Be rest assured because there is still hope for our children to bring back that life we all know. 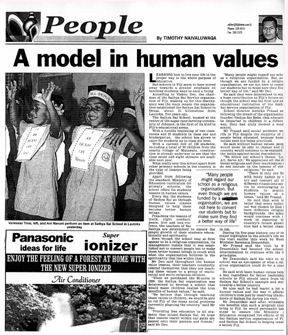 The life that made the late Pope John Paul II to describe Fiji as 'The way the world should be'. 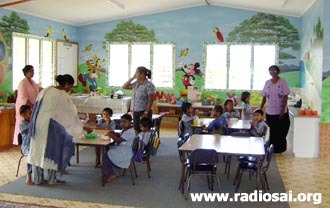 This is the media's opinion on the very successful Sai School in Fiji. 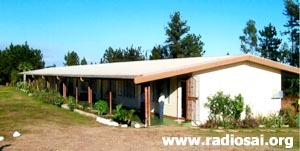 It was a grand affirmation of the good work diligently going on in a small corner of Fiji for five years now. 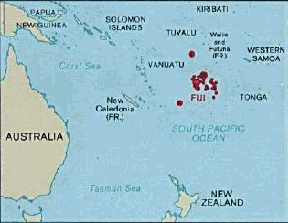 For those unfamiliar, Fiji is a group of 300 south Pacific islands (100 inhabited) renowned for their coral reefs and natural beauty. The ethnic mix in Fiji is comprised of Melanesians (51%) and Indians (44%) and was a land of peace until some community based conflicts a few years ago marred the island’s previous peaceful ambience. And yet by God’s Grace light always exists to show the way forward - light in the form of human values taught in the island’s Sai School. 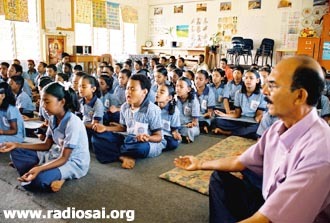 The Sathya Sai School in Fiji was founded in 2000 and accommodates 136 children from various ethnic and religious backgrounds, who come from the nearby farming communities and village. 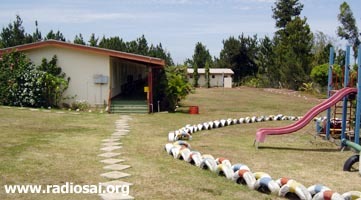 The school has nine teachers, three of them trained at the Institute of Sathya Sai Education, Thailand. 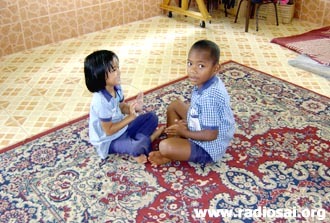 The children imbibe Swami’s teachings on human values, integrated into the Fijian national curriculum. Every morning the day starts with meditation. Then follows inspirational stories derived from the lives of great men and then everyone joins in congregational singing. All this enhances the group feeling of unity and togetherness. 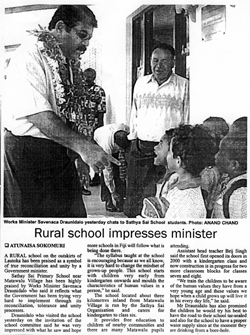 On November 2nd 2005 the school was visited by the Minister for Works, Government of Fiji, Mr. Savenaca Draunidalo, who gave glowing testimony to the school. 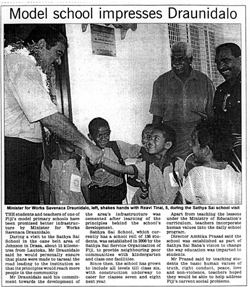 Many Fijian national dailies carried stories on how the Minister expressed immense happiness at the unique educational philosophy of the school and also pledged support to the school on behalf of the government of Fiji. Mr. Draunidalo said that other Fijian schools should learn from the Sai School and that it is a model of true reconciliation and unity for the country. 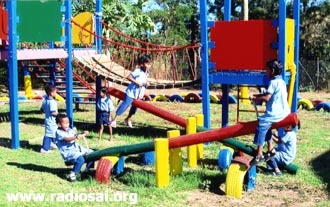 It is interesting to see the connection between the flow of government support and human values in that Mr. Draunidalo said his commit­ment towards the development of the area's infrastructure was cemented after learning of the principles behind the school's development. 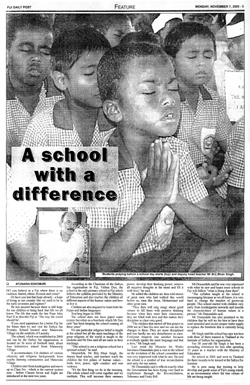 Fiji Daily Post, 3rd Nov, 2005. It is encouraging that the Fijian press has not only brought attention to this worthy project but has also unequivocally supported the ideals which Swami is promulgating. 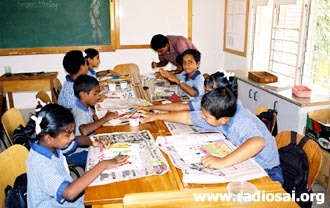 The Works Minister mentioned that he had learnt a lot about human values and how it affected children’s lives simply by observing the students of the school. He confirmed that he would personally take steps to ensure that the Ministry of Education recognised the efforts of the Sai Sathya Service Organization and the Sathya Sai School in helping create a better Fiji. He also promised to have the road to the school tar-sealed and provide proper water supply to the school replacing the current bore-well. The Sai School has just celebrated Swami’s birthday with 400 people, many from the local community and with a two page supplement in the Fiji Times. 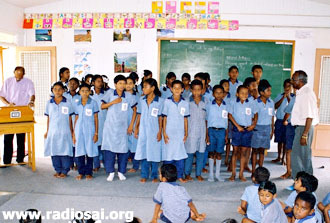 It is heartening to see how Educare – the Sai philosophy of education - is so active even in a remote island tucked away in the Pacific ocean. Slowly but surely, the world is moving towards a greater appreciation and understanding of the eternal and universal values of love and service and integrating these into educational curriculum for children. This, Swami has often said, is of paramount importance for the new world order of love and peace to dawn.